Bamboo steamer set, 3 piece, 12"
Steam cooking is clean cooking, and offers advantages to boiling and other wet-heat methods. 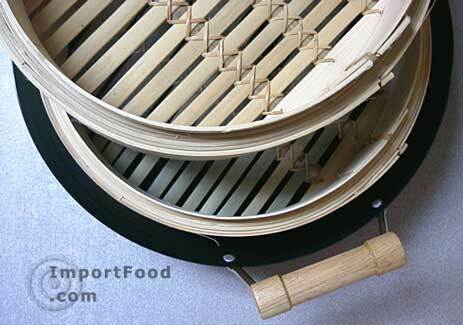 Our premium quality bamboo steamers control texture and color of food (especially vegetables). You get more nutrition and flavor since fewer vitamins and minerals are lost. Also use it to reheat food. This product perfectly complements our carbon steel wok, as it fits half-way up the wok. Just put a few cups of water in the wok and place bamboo steamer on it, and heat to a boil. 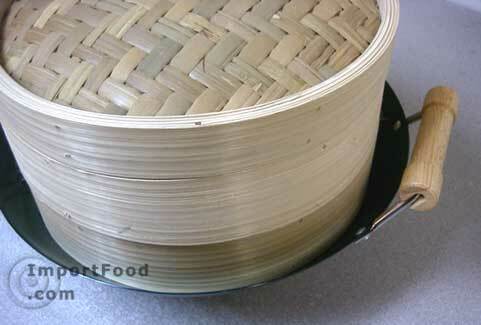 Bamboo steamer set has 12" diameter, 3 pieces (two trays, each 3" tall, lid is 2.5" tall), stands 8.5" tall. Click for more info.